You'll be £10.00 closer to your next £10.00 credit when you purchase The First VCs. What's this? Officers led and men followed; all were expected to do their duty without thought of reward. Enlisted men rarely penetrated the officer ranks and promotion owed more to money than merit. Then came the Crimean War. The incompetence and ineffectiveness of the senior officers contrasted sharply with the bravery of the lower ranks. Fuelled by the reports from the first-ever war correspondents which were read by an increasingly literate public, the mumblings of discontent rapidly grew into a national outcry. Questions were asked in Parliament, answers were demanded by the press – why were the heroes of the Alma, Inkerman and the Charge of the Light Brigade not being recognised? Something had be done. That something was the introduction of an award that would be of such prestige it would be sought by all men from the private to the Field Marshal. It would be the highest possible award for valour in the face of the enemy and it bore the name of the Queen for whom the men fought. This is the story of how the first Victoria Crosses were attained in the heat of the most deadly conflict of the nineteenth century. It is also an examination of how the definition of courage, as recognised by the awarding of VCs, evolved, from saving the regimental colours at the Alma to saving a comrade in the No Man’s Land before Sevastopol. Overall, a very articulate, excellent and most interesting read. A substantial amount of information on the institution and introduction of the VC. There are some interesting modern images of the battlefields as they look today. The book is nicely structured. Most of the text is a fairly traditional history of Victoria Cross winners, with a mix of background history and accounts of the deeds themselves, but with the addition of discussions of what types of activities would late be picked out. Most of these chapters cover the Crimean fighting, but we also look at the naval campaigns in the Baltic, and the fighting on the Turkish borders. Every few chapters turns back to the United Kingdom and the call for some form of recognition for the fighting men, the slow development of the award and the process by which the first winners were selected. The result is a useful study of the foundation of the most famous British award for valour. Thoroughly researched, and readable account of the origins of the Victoria Cross and those who earned it during the Crimean War. Good index, notes and bibliography; the marks of a solid researcher. 5 star Amazon review "So interesting." Since its creation in 1856, 1,364 individuals have received the Victoria Cross, awarded for outstanding bravery, courage or devotion to duty in the presence of the enemy. This book provides a crucial foundation block to the story of the V.C., its creation, and the early definitions of bravery. Written by an author who has written, edited and contributed to more than 300 books and magazine articles covering a vast variation of military history, he demonstrates his substantial authority and knowledge on his subject throughout. Its 287 pages also contains a poignant selection of photographs including shots of the British army in the campaign, useful photographs of the battlefield today, and illustrations from the Illustrated London News of 20th June 1857 showing Victoria Cross deeded. The books tells the story of how the first VCs were won in the first major war of Victoria's reign. It also examines how courage came to be defined for the purposes of deciding upon whom this iconic decoration should be conferred. 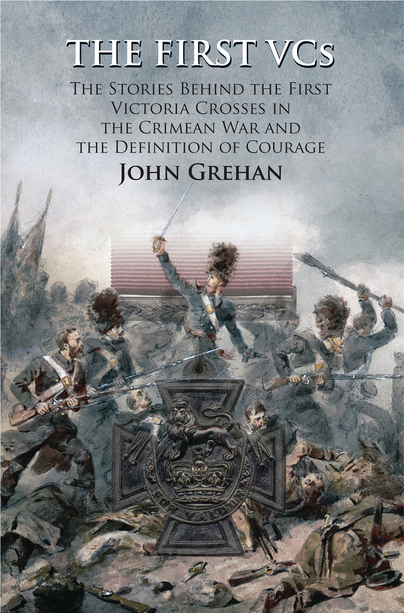 A long-overdue book about the awarding of the first Victoria Crosses of the Crimean War. Recommended.